The recommended franking machine for 300 items / letters a day. The Pitney Bowes SendPro C400 franking machine is an alternative low to mid volume machine to the DM220i. With slightly faster franking speeds, this machine will frank more mail for you in a day than the DM220i. Save even more money with the upgraded SendPro C400 machine today and view more details about the machine below. The Pitney Bowes SendPro C400 franking machine is a great low to mid volume franking machine capable of franking 300 items of mail a day. It is manufactured and supplied by the worlds leading franking machine supplier Pitney Bowes. It is small and compact, allowing it to fit in many office environment, and with whisper quiet operation, this machine will not distract the workforce when in operation. Why choose the SendPro C400 franking machine? Pitney Bowes have announced that this franking machine will be Mailmark compliant. This means that you can access this new and exclusive service with the SendPro C400 machine. Take full advantage of this new service today and receive lower franking prices. Monitor and track up to 500 and more different accounts on this machine and see how much money is spent by each department every week. Record and report all expenditure made by your businesses departmental accounts. Advertise your business on all mail pieces by franking a personalised logo and message every time. Give your business a more professional image and use this machine as a money generation tool. Improve the attractiveness of your mail items with the SendPro C400 franking machine. If you want to see the fantastic SendPro C400 in detail, view the video below and see just how easy the SendPro C400 is to use. There is a built-in 5 KG weighing scale with the SendPro C400. Upgrade this to a 7 Kg scale. Protect the SendPro C400 franking machine via the use of PIN code security. This machine is Smart Meter compliant. Take full advantage of this unique service with the SendPro C400. Track expenses for up to 25, 100, 500 or more departmental accounts on the Pitney Bowes SendPro C400 franking machine. Automatically record and report any VAT paid via VAT applicable services with the SendPro C400. This Pitney Bowes SendPro C400 franking machine is Mailmark compliant, allowing you can use the New Mailmark service and its benefits. 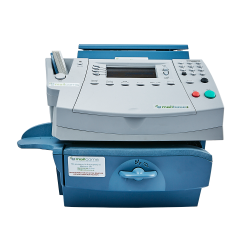 Use an analogue or LAN connection to recredit and update the SendPro C400 franking machine. Below you will be able to find all the specifications and options of the Pitney Bowes SendPro C400 that are available. We can guarantee that the Pitney Bowes SendPro C400 franking machine is a low volume franking machine available in the UK. It is a low to mid volume performer, but perfect for people starting to learn how to frank or upgrading their franking machine. Compare the SendPro C400 against other low to mid volume franking machines, and you may see that other frankers may be slightly more suited for your business. Increase productivity with the Pitney Bowes SendPro C400 and compare it to other low to mid volume machines. Please take a gander at the table below.